When the two equal forces of Unity and Multiplicity move cyclically and symmetrically within a finite field of activity, one waxing as the other wanes, four moments mark especially significant turning points. At two points in the cycle, the forces are of equal strength; at two other points, one force reaches the maximum of power it can ever attain while the other is as weak as it will ever be. Thus two points of equilibrium and two points of maximum disequilibrium occur. The two points of equilibrium, however, differ greatly in the quality of being they represent. In one of them, the principle of Multiplicity operates in a condition of dynamic ascendancy and almost explosive expansion, while the principle of Unity is losing control of the movement and becoming internalized as a force of resistance and containment. At the other point of equilibrium, the principle of Unity is a dynamic and irresistible power of condensation and unification, while the influence of the principle of Multiplicity is waning, yet never totally overcome. Each of these four moments in the cyclic process is the start of a definite phase of the total development of possibilities of being, but the whole cycle is most significantly divided into two hemicycles. During one of them, which can be conveniently symbolized as the Day-side of being, the power of the principle of Multiplicity predominates. During the symbolic Night-side, the principle of Unity controls the Movement of Wholeness. Nevertheless, in such a symbolism the "light" of Day is always to some degree present during the Night period as is the darkness of Night during the Day period. This diagram is probably the simplest way to try to illustrate what I attempt to describe in this and the next chapter. But like any such diagram, it can be misleading. One can view it horizontally, that is laying the book flat on a table, in which case the diagram has no "top" or "bottom." Or one can see it vertically, with the Godhead on top and Natural Man at the bottom, in which case it would better illustrate the idea of a vertical opposition between heaven and earth, between the sky and the depths of a strictly material realm of existence. Nevertheless, what the diagram does not reveal is a pulsation from a central core of being, where Unity has an almost totally dominant power, to a circumferential state of maximum Multiplicity. The Movement of Wholeness is therefore at some times centripetal, sometimes centrifugal. 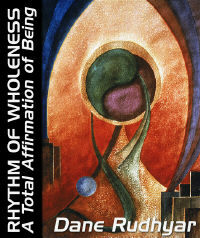 The pulsation from center to circumference and back to center is like the heartbeat of being or Wholeness. This pulsation, however, is far more difficult to illustrate in a diagram, because the moments of equilibrium at which the two forces are of equal strength would be "located" halfway between the core and the circumference. The advantage of a diagram that would picture such a pulsation is that it would picture the resemblance between the process and a mandala, which by definition requires something at its center. In another sense, the process would be likened to the spring of a watch; as the spring rhythmically contracts and expands, so does "being" or rather "beingness." These contractions and expansions operate at various levels, at which they may seem to be either immensely slow or extraordinarily rapid. The modern mind refers to them, in terms of the objective measurement of their speed, as vibrations Being is vibratory motion. But we should be able to think of subjective motion, which our senses and instruments cannot measure, as well as objective motion � that is, of vibration carried by a material medium or an exchange of particles in which activity can be measured at least indirectly. The Day period begins at the symbolic Sunrise, the Night at Sunset. Sunrise occurs when the principles of Unity and Multiplicity are of equal strength, with the principle of Multiplicity in dynamic ascent and the principle of Unity in retreat. During the Day all modes of consciousness are predominantly influenced by an objective approach to reality; during the Night, by a subjective approach. At the symbolic Noon of the cycle (Midday), the principle of Multiplicity reaches the maximum power possible for it to attain in the particular cycle under consideration. At Sunset the principles of Unity and Multiplicity are of equal strength, with the trend toward oneness in ascendance and the trend toward Multiplicity in retreat. At Midnight, the principle of Unity reaches the maximum of its possible strength � overpowering yet not absolute. Then the principle of Multiplicity begins once more to exert a dynamic influence, until at Sunrise its waxing strength balances that of the waning trend toward Unity.